What Are The Best Online Master's in Educational Technology Programs? What Else Can I Expect From an Educational Technology Online Master's Program? Although technology has become a cornerstone of modern society, educators have been slow to embrace the digital revolution. A recent survey from U.S. News & World Report found that merely 8% of teachers 'fully integrate' technology in their classrooms; meanwhile, 43% of students feel 'unprepared' to use technology as they advance to higher education or enter the workforce. The field of educational technology seeks to reverse these trends. Also known as instructional technology, educational technology is the study of various tools, platforms, and learning management systems used to facilitate and enhance learning at all academic levels, from preschool and kindergarten to the postsecondary level. This discipline not only explores the design and implementation of various educational media, but also the underlying theories and approaches to learning that drive these innovations. Educational technology is a popular area of specialization among today's students seeking master's degrees in education. Many graduates go on to pursue careers as instructional coordinators, utilizing different technologies to develop curricula and learning standards at schools across the country. However, the multidisciplinary nature of educational technology is also useful for aspiring teachers, school administrators, counselors, and other school personnel. Read on to learn more about the cutting-edge field of educational technology, as well as some tips for finding the best online master's degree in educational technology programs. Graduates with a master's in educational technology are prepared for many careers, including curriculum developer, curriculum director, and technology coordinator. Read more here..
WHERE CAN I GET A MASTER'S DEGREE IN EDUCATIONAL TECHNOLOGY? Many schools offer on-campus and online programs in educational technology. BestColleges has a ranking of 50 schools that offer online master's degrees in the field. Read more here..
WHY GET A MASTER'S IN EDUCATIONAL TECHNOLOGY ONLINE? Professionals who hold a master's degree have a lower unemployment rate than those with a bachelor's. They also have a higher earning potential. Read more here..
Educational technology programs teach students how to integrate various tools, platforms, and learning management systems to enhance learning at all academic levels. Read more here..
A master's in educational technology online program will introduce students to the latest tools and platforms used in the education profession, as well as the foundational technologies that have served as building blocks over the years. Some programs allow students to concentrate their studies in certain specialization areas, such as special education technology or early childhood education technology. Additionally, many online master's in educational technology include practicum courses, which allow students to visit working schools and receive hands-on training from experienced teaching professionals. Some programs culminate in a capstone project, as well, which may take the form of a formal presentation or a portfolio requirement. The requirements of an online master's in educational technology program will vary from school to school, so you should take time to research each program and ensure your top choices align with your career goals. Student outcomes can be quite useful during this process; carefully vet each candidate school to learn about dropouts, student retention, graduation rates, post-degree career statistics, and other learning trends. Accreditation is also crucial; all of your potential schools should have earned accreditation from a recognized, accrediting organization. Also keep an eye on courses and programmatic requirements, such as capstones and practicum courses, to ensure that you'll receive an adequate level of education, training and evaluation before entering the workforce. CAN I WORK WHILE I COMPLETE MY ONLINE MASTER'S in EDUCATIONAL TECHNOLOGY? Online students with part- or full-time jobs tend to thrive in asynchronous (or self-paced) master's degree programs. These flexible tracks allows you to access lectures and course materials using streaming video and other online platforms, submit assignments via email, take online exams, and participate in virtual discussions with your professors and fellow learners. Current technology also enables you to study away from your home computer using a laptop, tablet, smartphone, and other devices with Wi-Fi access. For added convenience, you will be able to coordinate practicum courses at schools that are reasonably close to your current residence, rather than commuting long distances. WHAT ARE THE ADVANTAGES TO EARNING MY MASTER'S IN EDUCATIONAL TECHNOLOGY ONLINE? The best online master's degree in educational technology programs are designed to mirror on-campus offerings. Web-based students follow the same rigorous curriculum as their brick-and-mortar counterparts, and often compete for the same jobs after graduation. In exchange, online learners follow a flexible course structure that is particularly conducive to those with jobs, small children, and other important commitments that may potentially conflict with campus-based education. The University of Florida offers a master’s in educational technology online that students earn in two years taking just two classes per semester. The school hosts the program as an extension of its M.Ed. in curriculum and instruction, and it combines theory with hands-on practical experience, preparing graduates for careers in one of education's fastest-growing fields. The University of Florida's College of Education divides the 36-credit master's in educational technology curriculum into four segments: a 9-credit curriculum and instruction core, 12-credit ed tech core, 12-credits of electives in ed tech, and a 3-credit culminating experience. Students can take all classes online. UF runs five online sessions per year, allowing students to move through the curriculum quickly. Most professors format classes asynchronously. Coursework explores subjects like distance teaching and learning, instructional computing, and blended learning environments. A 16-week practicum in educational media and instructional design synthesizes topics covered during the program. Students work individually on projects of their own devising, writing a thesis and presenting it for peer review. All applicants must submit baccalaureate transcripts, GRE scores, three academic letters of recommendation, a resume, and an essay explaining why this degree helps them meet their career goals. Students also need a 3.0 GPA or better on their last 60 undergraduate credits. Distance learners pay slightly more than on-campus students per credit. The university allows students to take up to nine credits before admission to the program. Johns Hopkins University is located in Baltimore, Maryland, and was the nation’s first research university. The Johns Hopkins School of Education offers several innovative online education programs, including a their Digital Age Learning & Educational Technology program. This educational technology online master’s degree is designed for teachers, administrators, mentors, researchers, and an array of other educational leadership positions. The 36-credit curriculum aligns with national standards from the International Society for Technology in Education and promotes mastery of instructional leadership and systems change management, data-based decision making, instructional/assistance technologies, and universal learning design principles. The program features two new specializations. The first is Online and Blended Learning Instructional Design, which focuses on the design and development of curriculum in digital learning environments. The other is Digital Age Learning Leadership, which includes coursework in data driven decision making, technology leadership for school improvement, and integrating media into standards-based curriculum. The curriculum includes three core courses on advanced applications and evaluation of instructional technologies, as well as a capstone seminar that showcases students’ mastery of technology used with diverse learning populations. These courses incorporate project-based and collaborative group elements. Students must also complete nine concentration courses on topics such as culturally responsive teaching or technology and the science of learning. Online programs at Johns Hopkins are offered in partnership with Coursera. Applicants must have a minimum GPA of 3.0 in their undergraduate studies to be considered. Additional requirements include the submission of an essay, resume, and two letters of recommendation. Selected candidates may be invited for a formal admissions interview. International applicants must also provide a degree evaluated by an approved credential evaluation agency and official English as a second language exam scores. Students can transfer up to six relevant credits from another accredited graduate school towards the program. Johns Hopkins is a member school of the National Council for State Authorization Reciprocity Agreements and is authorized to offer it's online programs to students residing in other member states. Needs-based scholarships and grants are available to qualifying full-time candidates. NCSU offers an online master's in educational technology degree that is perfect for educators, educational practitioners, or researchers who are interested in emerging technologies and their use in the classroom. The 30-credit program equips students with the skills needed for educational technology careers as master teachers, consultants, vocational education administrators, or business trainers. Students learn how to choose, implement, and assess the impact of technology-based programs and initiatives over time. The curriculum includes 18 credits of core requirements on topics like teaching creative problem solving and instructional design in technology education. There are also 12 credits of required electives that are chosen by students with guidance from a dedicated advisor. Finally, all students complete a field-based research practicum in educational technology to conclude the program. Many online courses at NCSU include video-based lectures and other learning formats that are accessible through the school's WolfWare website. While the online educational technology degree can be completed entirely online, exam proctoring is required. NCSU testing services offers two on-campus locations and assistance in locating proctors for students who live further than 50 miles from campus. A full-time class schedule includes nine credits of coursework each semester, or three to six credits for part-time students. The program has application deadline in the fall, spring, and summer, with start dates in the following semester. Applicants must have a minimum GPA of 3.0, three professional references, an outline of career goals, and recent GRE or MAT test scores to be considered. North Carolina residents receive a significant distance learning tuition discount, but all students enrolled in an online graduate program can apply for a limited number of grants and scholarships. All NCSU programs are accredited by the Southern Association of Colleges and Schools Commission on Colleges. The University of Virginia’s Curry School of Education offers an array of web-based programs, including an online master’s in instructional technology. Taught by the on-campus faculty, the 30-credit program explores the intersection of technology and curriculum design. Participants learn to make education both more engaging and more accessible. Students can pursue their diplomas entirely through the web at their own convenience. Ambitious degree seekers graduate within a single year. Curry's online master's in instructional technology is a specialization of the school's curriculum and instruction program, and students must accrue 15 credits in the core and another 15 in their specialty. Everyone must successfully complete coursework in the four pillars of the program: curriculum, instruction, assessment, and diversity. Curry’s small class sizes give students students plenty of interaction with professors and peers, and professors deliver most coursework asynchronously. Candidates must pass a comprehensive exam in order to earn a diploma. The program prepares graduates to move into curriculum development positions in public and private K-12 schools, adult and continuing-ed programs, charter and alternative schools, and government jobs. Alumni also take positions at museums, nonprofits, foundations, and military installations. Candidates for the program must submit undergraduate transcripts, letters of recommendation, a resume, a goal statement, and GRE scores that meet Curry’s minimum requirements: 450/150 verbal, 530/145 math, and 4.0 writing. The school waives GRE scores for applicants in possession of a teaching certificate and for those who take two of the program’s required courses as a non-degree student and pass them with a B+ or better. Curry offers three enrollment periods – fall, spring, and summer – and charges distance learners a flat fee no matter where they live. The University of Georgia offers an online master's of education in learning, design and technology, with an emphasis in instructional design and development. This two-year program teaches students how to use cutting-edge technologies and tools for designing lessons and training programs. This program is ideal for educators who want to become leaders in their schools and districts. Graduates are proficient in applying computer and multimedia technology in K-12 classrooms and analyzing learning problems and instructional design. Coursework covers a variety of topics, including trends and issues in the field, learning theory and instructional models, research methods, and collaborative methods with teacher peers. UGA host an annual digital learning conference that exposes students to educators who are excited about digital learning and provides them with an interactive forum for idea-sharing and networking. Graduate students progress through the program as a cohort and are encouraged to build a close working relationship with faculty members. UGA’s online master’s in instructional technology program is accredited by both the National Council for Accreditation of Teacher Education and Council for the Accreditation of Educator Preparation. Applications are accepted in the fall and spring, with admission in the following semester. Admission requirements for this online master’s degree in instructional design and technology program include recent graduate entrance exam scores, a statement of purpose, a resume with at least three years professional experience, official and unofficial transcripts, three letters of recommendation, and an online portfolio showcasing proficiency with design-based technology. Graduate test scores may be waived under certain circumstances, such as proof of a minimum GPA of 3.0 in a related field or a previously-earned graduate degree in a similar discipline. All online students at UGA pay the same tuition rate, regardless of residency. UCF’s MA in instructional design and technology program provides educators with the foundation necessary for successfully integrating digital technology into their classrooms. The program offers three different tracks: educational technology, appropriate for educators in K-12 and postsecondary settings; instructional systems, ideal for those who want to become instructional designers; or eLearning, an option for both educators and designers who want to create and deliver hybrid learning models. The curriculum emphasizes understanding the evidence-based principles behind design, implementation, and evaluation of quality instruction. This master’s in educational technology online program is designed for working professionals and can be completed in either a completely web-based or hybrid mode. While the program can be completed entirely online, not all electives or prerequisites may be available virtually. Some courses can be taken in a hybrid format, with weekly on-campus classes held every other week. Online students typically spend nine hours each week studying for each 3-credit course. All distance learners have access to a variety of UCF student support resources, including success coaches, career services, experiential learning and internship opportunities, and more. UCF also offers a wealth of online learning resources for interested applicants, including videos that showcase sample online courses and activities. All online students at UCF pay the same tuition rate, regardless of residency. International students are required to enroll for a full-time course load each semester, but are limited to taking one online course each semester. Graduate admission requirements include official transcripts from all past colleges and universities attended, as well as recent GRE scores. UCF is authorized to offer its educational technology courses online in most states, with the exception of Michigan, Minnesota, and Oregon. The Texas A&M College of Education and Human Development enrolls over 1,000 graduate students annually in its on-campus and online programs. 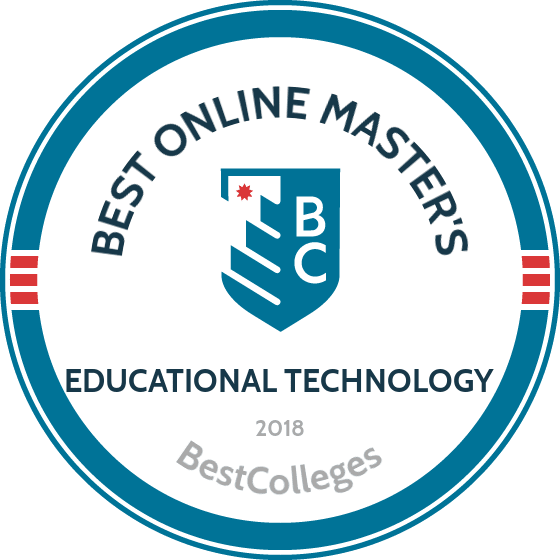 The online master’s in educational technology is a 36-credit program that provides students with a solid foundation in instructional design, learning theory, and educational practices. This program is ideal for students who wish to become instructional designers, course developers, and technology coordinators. The curriculum includes five required courses in design, psychology, theory, and research. Students can also choose elective courses that cover topics like educational game design, educational video and mobile learning design, eLearning development, and a practicum or internship. Students may also select two graduate-level electives outside of the educational technology online master’s program as long as they receive advisor approval. Asynchronous courses are delivered via eCampus or Moodle and live virtual advising sessions are available via Skype. Graduates enter the workforce ready to pursue careers in a variety of educational technology jobs and settings, including K-12 schools, government agencies, nonprofits, and other organizations. There is no minimum GPA requirement for admission, but students are encouraged to have a minimum GPA of 3.0 in their last 60 hours of undergraduate coursework. Additional admission requirements include official transcripts, letters of recommendation, and a biographical profile. International students must also submit satisfactory scores from an accredited English as a second language exam. Students must also submit a separate application with transcripts to the graduate school. Applicants are judged on a holistic basis, with program faculty taking into account life and work experiences, career goals, and personal characteristics. Texas A&M is accredited by the Southern Association of Colleges and Schools Commission on Colleges. One of four schools in the University of Houston system, Clear Lake created its online master of science in instructional design and technology program for individuals working in educational design and curriculum development. A midsized school of about 9,000 students, UHCL boasts a dedicated online wing where distance learners can pursue almost two dozen degree and certificate programs, including an online master's in instructional design. The 36-credit program gives students grounding in the application of cutting-edge education. Participants select from four areas of concentration: human resource management, game theory and design, information sciences, and industrial/organizational psychology. In keeping with the degree's focus, instructors use state-of-the-art technology to deliver coursework, and most do so in asynchronous fashion. UHCL designed the 36-credit program as a two-year course of study, with students enrolling in two online classes per semester. Some students take coursework on a full-time basis. Students must maintain a C or better while working through their 12-credit professional education classes, 15-credit major courses, and 3-credit elective course. To meet the remaining credit requirements, students select a thesis track, a research track, an internship/practicum track, or simply add a course. Those opting for the information science specialty must select the internship/practicum; those in game theory must complete the research project. Applicants need a bachelor's degree with a 3.0 in their last 60 hours. Those with a sufficient GPA can waive the GRE and MAT. Graduate students may transfer as many as 12 credits but must earn at least 30 credits through Clear Lake. The university is not authorized to provide online programming to residents of Pennsylvania, Wisconsin, Puerto Rico, or the District of Columbia. One of the nation's original land-grant institutions, UI offers both online and on-campus options to its more than 33,000 students. Founded in 1867, the school provides dozens of programs through the web, including a master's in educational technology online. The school's College of Education designed the program for working educators hoping to advance or change their careers. It emphasizes the development of curriculum using new media technology and techniques and explores ways of creating learning environments for diverse and differently abled pupils. Coursework takes students through subjects like computer-based instruction, distance learning, interactive video, and intelligent IT. follows a 32-credit curriculum. Students must complete a master's in education policy, organization, and leadership and then enter the technology specialist track in the learning design and leadership concentration. Program participants can complete all work online. Though students take most coursework asynchronously, Illinois professors typically include real-time, face-to-face sessions at scheduled times during the week. Some classes even feature collaborative projects with on-campus students. The university avoids proctored exams and expects distance learners to devote about 20 hours per week per course. To achieve "active" status, students must log in to their classes at least once every 72 hours and four out of seven days of the week. The school provides online students with support services like advising, tutoring, 24/7 IT help, library use, career counseling, and mentoring. Applicants must provide undergrad transcripts, a resume, a personal statement, and three academic or professional recommendations. The College of Education does not require the GRE for the master's program. Online students pay the same tuition as campus-based students. The largest institution of higher education in the nation's capital, GWU’s ten schools and colleges now offer more than 100 web-based programs, including a master's in educational technology online. The master's in educational technology leadership program takes an administrative approach to instructional tech. Students learn management skills as well as the latest research-based techniques in curriculum development, preparing them for upper-level positions in schools, businesses, and government agencies. GWU works with the Center for the Advancement of Research in Distance Education to push the boundaries of web-centered instruction. The school constructed its 36-credit curriculum around the idea that advancing human performance and learning should be the focus of educational technology. Students take 27 credits in core classes like educational policy, instructional design, and educational hardware systems, and afterward take three courses totaling nine credits in electives. Most coursework runs asynchronously, and students typically complete the program in two years. Additionally, candidates earn credits in practical settings using applied-project activities in courses like required instructional design. The Graduate School of Education also offers graduate certificates that participants can add to the master’s program. These certificates include: elearning, instructional design, multimedia development, and training and educational technology. Candidates must submit undergraduate transcripts, a resume, a statement of purpose, and two letters of recommendation. GWU requires neither the GRE nor the MAT. Online learners pay lower tuition rates than on-campus students. FSU offers an online master's of science in instructional systems and learning technologies, a specialty area that encompasses the fields of management, communications, and psychology with the goal of improving human performance and learning in a variety of educational settings. This program is designed for professionals who want to serve as instructional designers and develop innovative approaches that improve learning and perform in a variety of organizations, from schools to corporate offices. The curriculum emphasizes instructional design, emerging technologies, and performance improvement. Students in this 36-credit master’s in educational technology online program can earn their degree in just two years when enrolled in at least six credit hours during each of six semesters offered throughout the year. Coursework is composed of 18 core and 15 elective credits, as well as a three-credit capstone project. Online courses are delivered via the CANVAS learning management system. While online students are unable to access FSU’s on-campus learning labs and technology tools, they do have access to the school's education virtual lab, which offers remote access to all computer lab software. Online students also have access to the same support services as on-campus students, including the library and career center. Applicants must submit official transcripts showing a minimum GPA of 3.0 in their last two years of college study, along with qualifying GRE scores. A GRE waiver is available for outstanding students meeting certain criteria. Other admission requirements include a statement of career objectives, three letters of recommendation, and a professional resume. Applications are accepted in the fall, spring, and summer, with program start dates in the following semester. FSU's Office of Admissions offers out-of-state tuition reduction scholarships and waivers. Qualifying students may also be eligible for one of several FSU College of Education foundation scholarships. Set in Waltham, Massachusetts, Brandeis provides an array of cutting-edge online degrees aimed at working professionals, each one designed by an expert advisory board. The school offers an online educational technology degree as a 30-credit program built around creating net-ready educational content. The curriculum prepares graduates for positions in schools, corporations, nonprofits, and government agencies seeking to move their training programs onto online and mobile platforms. Brandeis’ GPS prides itself on small classes -- with an average course size of 12 students -- and the university insists that students will avoid massive MOOC-type virtual classrooms with hundreds of others. Professors deliver most coursework asynchronously with optional real-time online sessions. Students in the master of science in instructional design and technology program take a total of ten classes -- six in the required core and four electives -- offered in four 10-week sessions per year. Subjects covered include digital ethics, project management, assessment strategies, and foundations of elearning. Candidates must also complete a practicum, which they typically take as the final class of the program. Distance learners at Brandeis pay the same flat tuition rate. Applicants must send transcripts, recommendation letters, a resume, and a goal statement. The school has a rolling admission policy and frequently sponsors online admissions chats to familiarize students with their GPS offerings. Prospective participants may take up to two courses before formally enrolling in the educational technology online master’s. California State University, Fullerton offers an online MS in education with a concentration in educational technology, one of three concentrations within the program. The 16-month program is designed for PK-12 educators who want to improve their instructional technology skills. Graduates are prepared to continue their education in doctoral studies, or to pursue leadership roles within schools, districts, or other learning settings. This educational technology online master’s program includes 10 core and educational technology courses that are completed over four terms, with only one course taken during the first and third 16-week semester. After that, students complete two courses per semester in an accelerated 8-week format. All students must complete a required program orientation prior to beginning coursework. Courses cover a variety of topics, including multimedia development/instruction in the classroom and issues in instructional design of software for schools. A culminating seminar requires students to participate in a research-based project that integrates skills learned throughout the program. Courses are designed to be applicable to a student's current workplace and professional roles. A part-time schedule is available, though all coursework must be completed within five years of enrollment. Online students benefit from an interactive learning environment that brings together classmates and faculty for small-group discussions. The College of Education requires graduates to provide feedback on their educational experience, which is used to make ongoing improvements to the program. Applicants must have a minimum GPA of 3.0 over their last 60 units of college coursework, as well as teaching credentials or equivalent educational experience. All online students pay the same tuition rate, regardless of residency. Merit- and need-based scholarship opportunities available to qualifying students. The program is accredited by the International Society for Technology in Education. Work experience: Teaching credential (preliminary or clear) or equivalent experience. Michigan State University offers an innovative master’s in educational technology online (MAET) program that is designed for practitioners who wish to pursue careers in the educational technology field as technology directors, instructional designers, or consultants at a school or district level. Students must complete all degree requirements within five years from admissions and students typically earn their degree in just two years. Students must first complete the educational technology certificate, which requires three core courses on learning in school and other settings, approaches to educational research, and a final seminar in educational technology. Once this certificate is complete, students can apply for the 30-credit MAET online program, which is comprised of 10 courses. Core coursework covers a variety of topics in technology and leadership, as well as a culminating capstone project. Students also choose two elective courses on topics like learning science with technology and the nature and design of compelling experiences. Students can choose to pursue an optional three-course certificate in serious games, which includes focused instruction in game theory and design, or participate in an optional teacher internship program. MAET students work with a dedicated advisor to design their degree track that takes advantage of the program's multiple credential options. MSU accepts up to nine qualifying transfer credits from other accredited postsecondary institutions. Applications are accepted on a rolling basis, though students should submit all materials at least one month before the start date of their desired semester. All online students pay the same tuition rate, regardless of residency. MSU is an official member of the National Council of State Authorization Reciprocity Agreements. Applicants are suggested to check the school's state authorization page to ensure that this program will be available in their state. East Carolina University is located in Greenville, North Carolina, and offers over 90 online degree and certificate programs, including the MA in education in instructional technology. This program is perfect for nontraditional students interested in educational technology positions such as technology facilitators or directors in schools and/or districts.Students enrolled in this master’s in educational technology online degree learn how to plan, implement, and evaluate technology programs in P-12 schools. The degree leads to North Carolina licensure for computers in education. In this 36-hour program, students experiment with new instructional strategies and apply theory and principles through the systematic development of technology programs. The curriculum offers students plenty of opportunities to master a range of instructional media, methods and authoring tools that are used in today’s adaptive learning environments. The online master’s degree in instructional design and technology includes 12 semester hours of core courses in educational foundations, research, and social sciences. Students then choose from two sets of electives, which includes classes like integrating technology into math and science or technology specialists as teacher leaders. Online courses are offered asynchronously through the Blackboard learning management system. Students have the option of developing a final written portfolio or completing a thesis with an oral defense. All students must also complete 110 hours of a supervised internship in an educational setting. ECU offers virtual open houses throughout the year and students can apply online for the MAEd program at any time. As an NC-SARA member, ECU is authorized to grant accredited degrees to students residing in other member states. Applicants should check ECU's state authorization compliance website before applying to ensure that this online program is available in their state. Admission requirements include official transcripts and graduate-level exam scores, although the scores can be waived for students who already hold a master’s degree. Cal State Long Beach is one of the largest institutions of higher education in California. At CSULB’s thriving virtual campus, students can find the school’s online master’s in instructional technology. The school’s offers students a hybrid master of arts in education, option in educational technology and media leadership that requires participants to earn at least six credits while in residence in Long Beach. Cal State’s College of Education designed the curriculum to enable career advancement at educational, corporate, and nonprofit entities -- particularly for librarians -- with an added track that leads to a teacher-librarian services credential in California. Classes explore the use of IT and communications tools in the creation, management, and delivery of educational and training programs. The university expects students to familiarize themselves with word processing, spreadsheets, databases, desktop publishing, presentation software, and internet-based research prior to entrance. Students must maintain a cumulative GPA of a 3.0 as they work toward the 30-33-credit requirement, and they must pass Cal State’s graduate writing assessment. Learners also select a thesis option, a culminating project, or a comprehensive exam for program completion. Everyone creates an electronic portfolio. Coursework includes both asynchronous and real-time formats, and degree seekers typically finish within two years. At Cal State, candidates must first apply to the university and then to the College of Education. Applicants need a bachelor's with a minimum 3.0 GPA. (Those without this credential can take six credits of coursework to try and improve their GPA.) The college accepts undergraduate degrees from any field for the program. Webster University is a nonprofit institution that was founded in 1915 in St. Louis, Missouri. The school offers an online master's of educational technology that is designed for professional educators and practitioners who want to provide online training services for corporate and military organizations. Students learn how to use a range of multimedia tools, such as video, the internet, sound, graphics, and print to better engage students. The program can be completed entirely online or completed as a hybrid program. Students immerse themselves in core courses that cover topics like design & ethics, graphic design, desktop publishing, and digital video for educators. All online master’s in educational technology courses are designed by the same faculty who teach on-campus and include topics like graphic design for educators and curriculum design technology apps. The required 33 credits includes 12 credits of electives and a final capstone project that demonstrates a student’s understanding of the program's key topics. Students can enroll in up to seven credits per semester for full-time enrollment, or as few as one credit hour per semester for part-time enrollment and all courses follow Webster’s traditional eight- to nine-week term schedule. New students who have no prior experience in the education field are also required to complete an introductory course for the major. Courses are delivered asynchronously through Webster’s virtual WorldClassRoom. Application requirements include a bachelor's degree with a minimum GPA of 2.5 and an essay describing the student’s educational and professional interests. All online students pay the same tuition rate, regardless of residency. Active duty military, reserve, and guard members receive discounted tuition rates. Webster University alumni with a master’s from the School of Education can also apply for a tuition discount toward eligible graduate courses, up to a lifetime limit of 12 credit hours. Once admitted, students can register for classes in the fall, spring, or summer terms. Pepperdine University is a private, nonprofit institution based out of Malibu, California. The school offers a hybrid master's of arts in learning technologies degree that consists of 85% online study and 15% on-campus instruction. Students learn how to lead, develop a network, manage resources, make technological decisions, secure product funding, and support knowledge sharing in a variety of educational settings. This program can be completed just one year. Graduates have gone on to pursue careers as technology coordinators, training educators, and consultants. The curriculum is separated into courses that address conceptual tools, learning theory, and action research. Courses are designed to integrate with students’ current professional roles and cover a variety of topics, including distributed cognition and learning, understanding learning with technology, and technology leadership. Students learn in cohorts, or cadres, made up of about 20 peers. All cadres begin their program in July with a five-day CadreCamp session, which is hosted on the Malibu campus. Students must also complete two online courses during the remainder of the first summer session. As a final and integrative requirement, students design an action research project that will be implemented and assessed in their current workplace. The results of the project are then presented at a professional conference or event. Pepperdine offers rolling admissions and accepts applications until the program is full. Applicants must provide official transcripts, a statement of purpose, and two recommendations to be considered. If students have a GPA that is lower than 3.0 in undergraduate or graduate work, then they are advised to also submit a completed exception request form, available on the program’s homepage. All qualified candidates will receive an invitation for a final program interview. Appalachian State University’s MA in educational media – instructional technology specialist program offers a choice of four concentrations: general instructional technology, K-12 instructional technology, online learning and professional development, or new media literacies & global perspectives. The 36-credit program offers a blend of coursework in the design, application, and evaluation of a variety of media and technology tools. Students study topics like media literacy, instructional design, and telecommunications systems. Online courses are offered both synchronously and asynchronously through the Moodle learning management system. The general concentration in instructional design and technology focuses on computer/information systems and computer science in educational environments. The K-12 concentration is perfect for certified educators and emphasizes the creation and delivery of digital content for primary and secondary students. The online learning and professional development concentration helps students develop technical skills and an aesthetic understanding of quality instructional design. In addition to mastering technological tools for creating online content and professional development, students also learn how to assess great programs by considering ethical and social frameworks. The fourth concentration, new media literacies and global perspectives, prepares students to create and critique traditional and emerging technologies and digital media in a variety of educational settings. Students develop an understanding of each media’s impact based on language, design, cultural and global contexts, and other factors. Completion of this program can serve as a concentration in the school's doctor of education in educational leadership program. Students who earn their MA can apply up to 18 credits towards the EdD program. Application deadlines for this online master’s in educational technology are offered in the summer and fall, with enrollment in the following semester. Admission requirements include official transcripts, recent graduate-level exam scores, at least three references, and a resume. Brandman offers a master’s in educational technology online that readies graduates to teach the "21st century learner." The program requires those enrolled to have a current teaching credential (or to take an additional class). Brandman emphasizes diversity and social justice themes in its curriculum, teaching participants to educate learners of differing ages, backgrounds, and ability levels. Students employ standards developed by the International Association for K-12 Online Learning (iNACOL) as they proceed through their program, and the NCATE accredits the university’s School of Education. The 30-credit curriculum of its master of education in instructional technology includes both core requirements and instructional technology classes. Students complete six core M.Ed. courses and four courses in the specialty area. Brandman allows students to bring as many as six transfer credits into the program on the condition that they earn a B or better from a regionally accredited school. Candidates conclude the program by submitting a portfolio demonstrating mastery of the subject matter and writing an essay that synthesizes the material covered during the program. Applicants must submit college transcripts, two letters of recommendation, and a resume. They must also have a GPA of 3.0 on their last 30 undergraduate credits or a GPA of 2.75 or better and a passing score on the GRE or MAT. Distance learners who hold teacher licensure or who have passed the CSET, MSAT, SSAT or PRAXIS automatically qualify for admission to the program. All students pay a flat tuition fee. Brandman also offers online master of education degrees in leadership, early childhood, and curriculum and instruction. The University of Connecticut calls its online master’s in educational technology a "Two Summers" program. Students enroll in a cohort in July and visit UConn’s Storrs campus for the first classes. They then complete all coursework online during the fall and spring semesters and conclude the program with another summer residency on campus. Core competencies include the creation of e-portfolios, web-based learning, problem-centric and situational learning, assistive technologies learning, and games and simulation in education. Run by the university’s Department of Educational Psychology, the 30-credit curriculum of UConn’s master’s in educational technology features ten classes, usually taken in sequence. Most instructors deliver coursework asynchronously, leveraging tools such as videoconferencing, discussion boards, and instant messaging. The degree plan opens with a professional seminar, moves through a series of courses on differing elements of learning technologies, and culminates with an on-campus capstone that combines everything students learned over the course of the program into an electronic portfolio. The final session also prepares degree candidates for a required comprehensive exam. Some students elect to pursue their degrees at a slower pace than the standard two-year track by taking fewer classes during the fall and spring semesters and extending their program into the next academic year. Applicants must submit baccalaureate transcripts, a resume, three references, a personal statement, and a proof-of-residence affidavit. Out-of-state learners pay more than Connecticut residents. The largest campus of the State University of New York system, the University at Buffalo aims its educational technology online master’s at two types of learners: educators hoping to make their material more accessible and tech lovers hoping to combine technology and instruction. Coursework covers mobile devices, multimodal composition, and social networking. Graduates leave equipped for work as curriculum developers, online educators, community college instructors, instructional designers, and educational technology specialists in K-20 classrooms. UB stresses that this degree does not lead to New York teacher certification. Students in the master of education and technology program must accrue 33 credits -- 18 in the required core and 12 in one of three areas of emphasis: content and pedagogy; design, development, and technology; or online education. UB hosts some of the elective courses only on campus, and everyone completes the program with a master’s capstone project. UB offers all programs on a part-time basis and recommends that students allocate 9-12 hours a week for each three-credit course. The university schedules classes in 15-week sessions, following the traditional campus semester. Instructors typically deliver coursework asynchronously, though some faculty occasionally use real-time videoconferencing. The Graduate School of Education keeps class sizes small to encourage interaction between pupils, their peers, and professors. UB admits students on a rolling basis and programs begin in the fall and spring. Candidates must provide previous educational transcripts, two letters of reference, and a statement of purpose. Distance learners enjoy a 40% tuition discount. One of the twelve public universities in Florida’s state university system, the University of West Florida hosts more than 500 classes via the web each semester, and 30% of its 13,000 students attend class via the web. UWF offers an online master’s in instructional technology that gives participants a solid foundation in pedagogical tech. The 36-credit curriculum prepares graduates for careers as corporate trainers, technology coordinators, elearning specialists, distance-learning developers, and curriculum designers. Those enrolled can select from two areas of concentration: human performance technology or distance learning. The program does not require a teaching license. Students can earn their master of education in instructional design and technology 100% online in two years, taking one class per term in accelerated, eight-week sessions. The curriculum consists of 15 credits of core coursework, 12 credits in the area of specialty, six elective credits, and a three-credit capstone. Typically taken as the culminating course, the capstone counts as a field practicum in which participants put theory into practice. UWF provides its web-based students with an array of support services, including library access, technical help, advising, and career counseling. The university also hosts several orientation videos and provides dozens of articles and posts for its online students. Applicants must send a letter of intent and undergraduate transcripts with a minimum 3.0 GPA on the last 60 hours of classwork. The university admits applicants with a lower GPA on the condition that they possess acceptable scores on the GRE, MAT, or GMAT. All online learners pay a flat tuition fee. SUNY Albany is a leader in online educational and offers an MS in curriculum development & instructional technology. The program’s research and collaborative emphasis serves as a foundation for students pursuing educational technology and training careers in school, military, and business settings. SUNY’s program is designed for students looking to build their expertise as instructional design leaders who are well-versed in cutting-edge technology instruction techniques. This online master’s degree in instructional design and technology includes a versatile, 30-credit curriculum that can be tailored to meet a student’s specific interests and career goals. Students select courses in each area of the curriculum on topics like foundational curriculum development and instructional technology, as well as choose between a research seminar or master’s thesis to conclude the program. Alternatively, students can complete the program with the goal of specializing in curriculum development or design of instructional technology in K-12 or professional settings. Online courses are delivered asynchronously through the Blackboard learning management system. Distance learners have access to SUNY’s career center services, including virtual career fairs, and virtual library resources. SUNY offers special graduate funding programs for economically disadvantaged full-time students, as well as to New York State residents who have recently finished their undergraduate degree. The school also offers need- and merit-based financial support programs. Applications are accepted on a rolling basis and require submission of official transcripts and three recommendations, two of which must be from professional contacts. Students interested in online education can complete a 15-credit program that leads to a certificate in online learning and teaching (COLT). Credits earned in the COLT program count towards the MS in curriculum development & instructional technology, allowing students to earn both degrees concurrently. The 33-credit MA in instructional technology program at UNI prepares educators for educational technology careers in a wide range of educational environments as integration specialists, special education media specialists, instructional designers and more. The curriculum encourages students to develop an understanding of ethical digital citizenship and the impact of global culture on technology and vice versa. New students work with a program coordinator to plan an academic track, and then work one-on-one with a faculty advisor for the remainder of the program to ensure that their goals are met. Classes are completed in a fixed sequence, with students completing two courses each semester. Most classes include a weekly evening session via video conferencing, with all other assignments accessible via the Blackboard learning management system. Courses cover a variety of topics, including the use of social media in education, educational technology and design, and using databases in education. As part of the program's exit requirements, students must submit a graduate-level paper and multimedia electronic portfolio using video narrative, audio, interviews, and other tools to showcase what they’ve learned throughout the program. All graduate students must maintain a minimum GPA of 3.0 throughout the program in order to graduate. Students typically earn their degree in just two years. Applicants don’t need professional educator licensure, unless they’re pursuing the optional school teacher librarian endorsement. While there are no required admission tests, international students must demonstrate English proficiency with qualifying exam scores. Applications are accepted in the spring and admission occurs in the following fall semester. Students can transfer up to one-third of the program's coursework from other institutions, as long as it was earned with a grade of B or better. All online students at UNI pay the same tuition rate, regardless of residency. Established in 2013 with the merger of two schools in the University of Texas system, the University of Texas Rio Grande Valley’s two campuses and four learning centers boast more than 28,000 students, many of them online learners. UTRGV offers an online educational technology degree designed to create teachers of K-12 classrooms; military trainers; and corporate, nonprofit, and higher education instructors. The master of education in educational technology emphasizes the theory, research, and application of tech-based education. The program explores how to integrate mobile applications, online programming, and other forms of telecommunications into the classrooms of the 21st century. The 36-credit curriculum requires candidates to complete 27 credits in core courses and nine in electives, and it includes a practicum, a capstone, and an eportfolio. Students may enroll in a thesis or non-thesis track. Both the practicum and the capstone see participants planning and managing a curriculum in a real-life context. Most professors deliver coursework asynchronously, and the program boasts extensive interaction between faculty and students. UTRGV recommends that students invest five to ten hours per week, per class, and most students complete their course of study in three years. The university offers start dates in the spring, summer, and fall. Applications to UTRGV’s graduate programs must include a resume, a personal statement, GRE results, and official transcripts with a 3.0 GPA or better from all previous colleges. The flat tuition rate for distance learners is significantly less expensive than the rate for non-resident, on-campus students. Prospective candidates can try an online demo to determine whether web-based learning suits them. Indiana University Bloomington offers an MS in instructional systems technology that prepares students to design effective instructional materials that can be delivered in multiple digital mediums. Students construct and test educational technology processes, products, and services that can be applied in a variety of educational or training environments. The curriculum also emphasizes the analysis and evaluation of educational tools and systems. The program includes 15 semester hours of core classes, 12 semester hours of specialization electives, and a minimum of nine semester hours in either adult learning or learning/cognition in education. All required courses are designed to be completed in just over three years. An optional internship is available for students who want to gain additional hands-on experience. One highlight of this online master’s in instructional technology program is the portfolio workshop that provides students with real-world experience in developing instructional technologies. Students can enroll in the professional portfolio seminar as part of their elective fulfillment or can complete a portfolio independently for no credit. All courses are delivered through the IUconnectED virtual learning platform. Students work with academic advisors throughout the program to ensure that their chosen electives align with their professional goals. Admission to the School of Education requires an accredited bachelor’s degree with a minimum GPA of 2.75 or a master’s degree with a minimum GPA of 3.30, as well as recent GRE scores. International applicants must also submit English as a second language exam scores. Admission into the program is competitive and partially dependent on available space. After being accepted, students have up to two years to enroll in the program. Students can apply for graduate-level awards through the online IU GradGrants Center. The master’s of education in instructional systems technology from UNC Charlotte is the only program of its kind in the state to have accreditation through the Association for Educational Communications and Technology. This entirely online program offers three concentrations: school specialist, training and development, and online learning and teaching. The school specialist concentration is a great option for P-12 educators who have an "A" or "G" level North Carolina teaching license and intend to earn an advanced "M" license. The training and development concentration is designed for those who want to work in corporate, higher education, military, or government settings. The third concentration, online learning and teaching, is ideal for those interested in designing, developing, or managing online learning and teaching programs. Students typically earn their degree in just two years, regardless of concentration. All concentration options include 18 credits of foundation courses, a six-hour internship and capstone project, and 12 credits of elective coursework. Core courses help students develop a solid foundation of instructional technology design, technical, and pedagogical skills. Online courses for the online master’s in instructional technology program are delivered through the Canvas learning platform. UNC Charlotte is also a member of the Southern Regional Education Board's Electronic Campus. Distance learners have access to many of the same student services as on-campus students, including library resources, the career center, veteran student services, and more. Online students also have access to UNC’s Distance Education Testing Center, as well as a network of various proctoring locations for all exams. Application requirements include official transcripts with minimum GPA of 2.75, an essay outlining professional goals, graduate-level test scores, and three letters of recommendation. Liberty University’s master’s in educational technology online includes instruction in the Christian worldview. The school offers its master of education in ed tech and online learning entirely online. The school established the 36-credit curriculum for educators already in possession of their teaching licenses who either want to add high-tech programming to their classrooms or want to find alternative work that prioritizes the use of technology in the classroom. The program does not lead to licensure. Liberty divides the curriculum of its master of education in teaching and learning: educational technology and online learning program into thirds: students take five classes in the advanced education core, five more classes in the major, and two "professional courses," one of which is the capstone. Because the capstone takes distance learners into classrooms, the university requires a background check. Students must maintain a 3.0 GPA to earn the degree, and all distance learners must take the graduate writing course in their first semester. Liberty allows as many as 18 transfer credits, and the program does not require residency. The faculty formats all coursework asynchronously in accelerated, eight-week sessions, allowing students to continue to work full time. Applicants must submit a resume and undergraduate credentials. The university charges a flat tuition rate to all online students. The school’s College of Education hosts more than a dozen online master’s of education programs in a wide variety of specialty areas. The Southern Association of Colleges and Schools Commission on Colleges accredits Liberty. Texas Tech’s master of education in instructional technology became one of the school’s first internet-based programs in 1996. It promotes effectiveness, creativity, and efficiency and prepares individuals intending for work in K-12 schools, corporate training programs, military instruction, and continuing education. TTU divides its master's in educational technology online curriculum into three phases. Phase One focuses on foundational work in design, distance ed, and instructional technology. Phase Two consists of courses in creation and evaluation. Phase Three focuses on the application of newly learned skills in a problem-solving practicum. Students must pass one phase before continuing on to the next, and the university’s EDIT program (educational and instructional technology) incorporates needs assessment and evaluation methods at each curriculum phase to ensure learner growth. Traditionally, distance learners take two courses per semester over the course of two years, following the usual semester format. Students must be careful selecting electives, as the school does not offer all classes online. Participants can earn all 39-credits via the web, and transfer in as many as six credits -- though the program does not grant credit for grades below a C. The school requires the passing of a comprehensive exam to conclude the program; degree seekers may take it twice if necessary. Admissions must first accept students into TTU’s graduate school and then into the College of Education. Applicants must send a resume, a personal statement, and two professional recommendations. Degree seekers can begin at any time of the year. The University of Arkansas offers an online master's of education in instructional technology degree through the Department of Curriculum and Instruction of the College of Education and Health Professionals. The 34-credit, non-thesis program teaches students a broad range of skills, including learning theory, instructional systems development, and multi-media design. The program is offered fully online but some face to face offerings can be integrated if desired into the student’s program of study. Graduates are prepared for educational technology careers in instructional design, training, or curriculum coordination within a variety of school, government, or other educational settings. The program includes 14 credits of innovative and practical courses including web design, distance learning, and grant writing. Students must also complete a culminating ePortfolio during their final semester and receive a passing score on a comprehensive exam in order to graduate. Full-time students can finish the program in just one-and-a-half years, though students have up to six years to finish all requirements. Applicant must have a bachelor’s degree with a minimum GPA of 3.0 in the last 60 hours of coursework, and submit three professional recommendations, a statement of career goals, and official transcripts. Those who do not meet the minimum GPA requirements can submit graduate-level exam scores to be considered for admission. Applications are accepted in the fall, spring, and summer, with program start dates in the following semester. All online students at Arkansas pay the same tuition rate, regardless of residency, and students are offered a flexible monthly tuition payment plan to assist with budgeting. Arkansas residents who are certified teacher or administrators may also be eligible to apply for the Teacher Opportunity Program, which grants tuition reimbursement awards for up to six college credit hours. USC offers an MEd in educational technology that provides students with the skills needed to design, evaluate, and deliver technology-based instruction and training in multimedia design, software, assistive technology, distance learning platforms, and more. The 36-credit program is ideal for both current educators and other education-related positions, from corporate trainers to software developers, who are looking for more advanced study in the field of educational technology. USC suggests that students take two courses each fall and spring semester and three courses during the summer in order to earn their online educational technology degree in two years. Students complete core course requirements in design and technology, with classes such as technological application for diverse populations and management of technology resources. The program also includes a required internship in educational technology and one elective. Instead of a final exam, students build an electronic portfolio that demonstrates their acquired knowledge and skills, which are then presented at professional conferences. Online coursework is delivered through the Blackboard learning management system. Graduates who already have South Carolina teacher licensure are eligible for add-on endorsement in online teaching. This add-on allows them to teach in the SC Virtual School program. Applicants must submit official transcripts from an accredited university with a minimum GPA of 3.0, qualifying MAT or GRE scores, a personal statement outlining professional objectives and relevant technology experience, and letters of recommendation. Students who do not meet these qualifications may be considered for admission on a case-by-case basis. Applications are accepted on a rolling basis and students can begin their program as soon as they’re admitted. USC offers a number of education-specific scholarships for graduate students and certified South Carolina teachers may be eligible for tuition discounts. OU offers an online master’s in instructional technology that explores the very nature of education. Hosted by the Department of Educational Psychology, the master’s in 21st century teaching and learning blends theory, research, and practice. Designed for working teachers, the program asks students to examine their own teaching methods. The school places emphasis on collaboration and open educational resources, and participants must make a weekend visit to Norman to meet residency requirements. UO set the program up to run as a cohort -- with as many as 25 students per grouping -- and provides iPads to everyone enrolled to keep classmates connected. The school sequenced the degree plan such that each student takes six or seven hours of courses each semester in succession across 18 months. The Department of Educational Psychology offers most classes once a year, so students wait a whole rotation if they miss one course. Cohorts begin each January. The university encourages professors to include some form of real-time content in their classes, but not all do. Most format their coursework asynchronously. Students construct a professional portfolio as they proceed through courses like technology and social media in education, motivated change, and reflection for the 21st century. At the end of their program, candidates present and defend their portfolio during an oral argument. Applicants must submit their bachelor transcripts, three letters of recommendation, a personal statement, and a resume. UO does not require the GRE. Successful candidates need a 3.0 during their undergraduate years. Because of the structured nature of the degree plan, the university does not allow transfer credits. Virginia Tech offers 280 programs to more than 34,000 students from all over the world. VT Online brings the Blacksburg institution’s graduate school programs to the web, including a master’s in educational technology online. The university developed its ed tech curriculum to transform K-12 teachers into the next generation of professional instructional technologists. The program also caters to educators in the business, government, and nonprofit sectors. Most who enroll also work full-time. The master of arts in education, curriculum and instruction with a focus on instructional technology (ITMA) promotes a rigorous plan of study. Most program participants take a single course per semester and two in the summers, finishing the degree in three years. The 30-credit curriculum opens with three foundational courses, after which distance learners can take three electives before finishing with four more requirements. The program devotes the final semester to the creation of a portfolio that meets standards set by the Association for Educational Communications and Technology. Virginia Tech accepts up to six graduate transfer credits from an approved institution. Instructors at the school deliver coursework asynchronously with no scheduled meetings, and students move at their own pace. Learners may take four classes before officially enrolling as degree candidates. Tuition varies depending upon residency and teaching status. Virginians pay roughly half of what non-residents pay, and K-12 educators receive discounts. Applicants must submit a resume and official collegiate transcripts with an undergraduate GPA of 3.0 or better. VT does not require GRE scores or letters of recommendation and may admit some applicants on a provisional status. Located just south of Los Angeles in the town of Azusa, APU is an evangelical institution that believes in putting God first in all aspects of university life. This extends to its graduate programming, and the school prides itself on providing flexible, Christ-centered pathways for nontraditional learners. APU offers its online educational technology degree to experienced K-14 classroom and online teachers. The master's of arts in educational technology carries accreditation by the NCATE. Students enter the program in cohorts of 15, and the program starts three times a year. Learners complete all work online asynchronously and can finish their studies in under a year. APU employs a hands-on, project-based approach, and cohorts move together through a sequenced plan of study, completing one accelerated, eight-week course before beginning another. The final course -- educational applications of technology -- focuses on the creation of a digital portfolio. Coursework explores topics related to technologically enhanced learning, including digital communications, cross-cultural literacy, international education, digital imagery, and educational applications. The School of Education does not allow students to take more than eight units per eight-week session. Students access course material through the Sakai LMS, and the university recommends setting aside three hours of homework time for each credit hour. Prerequisites include 12 undergraduate or graduate credits in education, though APU will waive three credits for each year of teaching experience. The university allows students to transfer up to three credits in to the program. Applicants must submit a description of their tech skills and goals, a resume, and undergrad transcripts. All distance learners pay a flat tuition rate. One of the nation’s top public universities, Ohio State’s College of Education and Human Ecology offers an educational technology online master’s that students pursue entirely through the web. The school’s master of learning technologies program propels students into the future of education -- in both private and public settings. Subjects covered include instructional development, tech skills, assessment, educational theory, reading research, and tech-based learning environments. Ohio State established the 30-credit program with working professionals in mind, and most classes run asynchronously for convenience. Students can enroll on a full-time or a part-time basis. The curriculum consists of seven core courses, a research class, an elective, and a capstone comprised of a practicum, action research, and the creation of an eportfolio. The College of Education and Human Ecology also offers a variety of graduate minors that degree candidates can use to enhance their resumes, including teaching in virtual environments, applied developmental science in education, college and university teaching, and quantitative research methods. The university boasts close-knit classrooms with a student-to-faculty ratio of 19:1; classmates come from an array of professional backgrounds. Participants often learn almost as much from each other as they do from Ohio State’s distinguished faculty. The College of Education and Human Ecology requires a resume, transcripts from all undergraduate institutions attended, three letters of recommendation, and a statement of purpose. Admissions does not require GRE score unless students possess a baccalaureate GPA of less than 3.0. The College of Education and Human Ecology boasts almost 100,000 in its alumni ranks, giving program participants exceptional networking options. All distance learners pay in-state tuition rates. In 2017, the UAB School of Education announced the formation of its new master’s program in instructional design and development. The purpose of the UAB Instructional Design and Development (IDD) program is to train qualified instructional designers who effectively analyze, design, develop, evaluate, and implement quality online, blended, and on-ground instruction. This fully-online program follows and achieves the International Board of Standards for Training, Performance and Instruction (IBSTPI) competencies and performance standards for instructional designers. The School of Education established a plan of study for its master of science in instructional design and development in which students take a single class each seven-week term, earning a total of 30 credits. Each semester is two terms long, and the school schedules all coursework asynchronously, meaning students can do classwork on their own schedule. The ten required classes cover all aspects of instructional design, including trends, differential systems, alternate models, and assessment and evaluation. Degree candidates must submit a digital portfolio in their final semester and pass a comprehensive oral examination to earn their diplomas. Applicants must submit proof of a baccalaureate degree showing a 2.5 GPA in all undergraduate coursework, two letters of recommendation, and an essay. UAB admits students from any background and does not require GRE scores. Residents of Alabama pay about half the tuition of non-residents. Thanks to continuing enrollment, participants can begin their course of study at any time. NCATE provides accreditation for UAB’s School of Education. Philadelphia-based Saint Joseph's University offers several online master's programs, including a master's of science in education in instructional design and technology. The program features hands-on practice with state-of-the-art technologies used in the classroom and in corporate training environments. The 36-credit program offers courses in emerging technology software, like game-based learning and online learning, along with multimedia and instructional design skills. Students learn best practices for using educational technology to engage English language learners, special needs students, and those with learning disabilities. Featured electives cover a variety of topics, including design and technologies for differentiated instruction and teaching & learning at a distance. The program’s eight required core courses include a 12-week internship in a K-12 educational setting or corporate environment. Graduates may choose an elective course that grants them eligibility for the instructional technology specialist certification in Pennsylvania public schools, a credential that may transfer to other state school systems as well. Students take one eight-week course during each of the six academic sessions offered annually in order to graduate in two years. While online courses are not entirely self-paced, students can complete assignments and discussions at their convenience within each week. Additionally, some classes may require a weekly meeting with the instructor. SJU Online offers 24/7 technical support and all students have access to a Student Services Coordinator for ongoing program assistance. Applicants for the online master’s degree in instructional design and technology do not need any previous education experience, but are required to submit transcripts, two letters of recommendation, and a personal statement. Applications are accepted on a rolling basis and the program offers start dates in August, January, and May each year. All online students at Saint Joseph's pay the same tuition rate, regardless of residency. Active-duty service members, reservists, and their spouses in all branches of the military receive a tuition discount. Program start dates: January, May, and August. Set in the northeast city of Stillwater, Oklahoma State boasts one of the most extensive education technology programs anywhere. OSU enjoys its own Emerging Technologies Research Lab and an educational tech and media student association, and prospective instructional technologists can select from master's or certification programs in ed tech and school library media. They can also pursue graduate certification in online teaching. The master of science in education technology at Oklahoma State is a hybrid program. Students conduct most of their work asynchronously, but the university requires a visit to its campuses in Stillwater or Tulsa for two of the core classes and several electives. The program focuses on technology integration, online teaching, and information management. OSU divides the curriculum of its master of science in educational technology into four sections. Students complete four core courses, take a research and inquiry class, explore five classes in major coursework, and finish with 2 classes in electives or thesis work. Degree seekers must maintain a cumulative GPA of a 3.0 or better. OSU only grants credits for grades above a C. At the end of the program, students must either defend a thesis or present a creative project -- generally an eportfolio -- for review. Most graduates earn their degrees in three years or less. To be eligible for admission to OSU’s MS in ed tech program, students need a 3.0 or better from their bachelor’s. Applicants must send admissions all collegiate transcripts, a statement of professional goals, and three letters of recommendation. Accredited by the Higher Learning Commission, OSU accepts applications on a rolling basis. The University of Dayton’s MS in education in technology enhanced learning prepares in-service teachers to integrate technology in their classrooms. The curriculum specifically focuses on meeting the learning needs of students in PK-12 educational settings. All coursework meets the requirements for the computer technology endorsement in Ohio and the graduate certificate in technology-enhanced learning. Based on a post-graduate 2016 survey, UD's School of Education and Health Science graduates have a 99% success rate across all programs in finding employment. This program includes nine credits of core requirements, 16-19 credits of concentration requirements, and a culminating thesis or seminar option. Coursework covers a variety of topics, including models of teaching, web design and development, and multimedia production. Online courses are delivered asynchronously through UD’s Isidore platform, which is supported by Sakai software. Students in the educational technology online master’s program may also enroll in the unique Lalanne program, where graduate students live in a communal setting with other teachers during their course of study. Lalanne teachers make a two-year commitment to teach in an under-resourced Catholic school in Cleveland, Cincinnati, Dayton, or Indianapolis. Application requirements include three letters of recommendation, a personal statement or resume, and graduate entrance exam scores for those with an undergraduate GPA below 2.75. International students must have completed at least 16 years of education, including the equivalent of a bachelor’s degree that is recognized by their home country’s educational minister. Full-time Catholic educators and students in the Lalanne Program receive a substantial tuition discount for online courses. UD is also a member of the Yellow Ribbon Program and provides annual scholarships to 20 graduate military students on a first-come, first-serve basis. UNCW offers a master's of science in instructional technology (MIT) through its Donald R. Watson College of Education. Students enrolled in the MIT program learn a broad range of interdisciplinary skills in instructional systems design, computer science, communication theory, and more. All courses can be completed in an asynchronous or synchronous format online, as well as in a hybrid format. Class sizes are kept small, with an average of seven to 15 students per course. MIT students have access to the MIT alumni network, which allows them to meet other instructional design professionals in their region. Students can also take advantage of job search assistance through UNCW's career center. Graduates of this educational technology online master’s program have a 99% job placement rate and are prepared for a variety of positions, ranging from K-12 educators to government and military program training managers. The MIT program offers the option to earn an online teaching and learning certificate, which is ideal for K-12 educators, instructional design professionals, and others interested in implementing and evaluating online learning programs in a variety of educational environments. Students are also eligible for an endorsement as a Instructional Technology Specialist or Educational Computing and Technology Facilitation. The required 18 credits for these certifications can be integrated into the MIT curriculum, allowing students to earn their certification and degree concurrently. Students who are pursuing advanced licensure through the online master's in educational technology program are required to have North Carolina "A" level licensure prior to acceptance. Graduates who meet all program and licensure requirements are recommended for "M" level licensure as an instructional technology and computer specialist. Full-time students can earn their IT certificate in one year and MIT in two years. However, most students are enrolled part-time and complete their degree in about three years. One of the 23 universities in the Cal State system, CSUSB offers an online master’s in instructional technology that uses technology to build community and revolutionize learning. The San Bernardino institution’s College of Education built the program to foster leadership development, focusing on topics like creating learning objectives, analyzing workflow, maximizing institutional knowledge, and developing efficient training methods. CSUSB offers its master of education in instructional technology on-campus, as a hybrid degree, or entirely online. The same program options are also available through the Palm Desert campus. Cal State’s MA in Education requires a total of 48 units for program completion. The university breaks the curriculum of the instructional technology major down into several sections. Degree candidates must take three classes in the master’s core, four in the instructional technology core, three or four in electives, one in an area of concentration, and one in a culminating experience -- a master’s project, a thesis, or a comprehensive examination. Students may elect to specialize in technology and learning or design and development of instructional materials, and they and they must complete a practicum at a school or agency in which students will have opportunities to apply what they learned in classroom to real world and to improve their leadership in instructional technology. CSUSB allows participants to take up to eight other units from other departments, programs, and even colleges and universities and apply them toward the program. Each participant must present and defend an eportfolio before they sit for their final exam. Applicants must fill out an application to the Cal State system and submit three letters of recommendation and undergraduate transcripts -- the latter of which should show a 3.0 GPA on the last 60 credits. CSUSB accepts some students whose GPA is 2.5 or higher but lower than 3.0. The Western Association of Schools and Colleges accredits Cal State San Bernardino. In 2006, the University of Hawaii began offering an online master’s in educational technology. The 33-credit program shares the same standards as its brick-and-mortar counterpart, and results in the same diploma. Apart from two required weekend visits to UH’s campus, students pursue the curriculum entirely online. The university designes coursework for distance learners, and the once-weekly, real-time sessions take place in the evening to accommodate work schedules. Participants begin their studies on campus at the first of two residencies scheduled for the first semester. After these sessions, they work exclusively online. The curriculum is cohort-based with students proceeding together through the six core courses. Five courses in electives follow the core, and individual students tailor electives to meet their own professional goals. Everyone must complete an instructional design and technology practicum and a seminar in technology leadership. Degree candidates conclude their studies with a culminating experience -- either a master’s thesis or a research project -- and most finish within two years. UH accepts up to six transfer credits, and the university offers virtual tours of the program. Many students elect to combine the master of education in learning design and technology degree with a second master's in library information sciences. Applicants to UH’s online education technology master’s must supply baccalaureate transcripts, a resume, a statement of purpose, and three letters of recommendation. The ideal candidate possesses a 3.0 GPA on the last 60 credits of their bachelor’s degree and will have some work experience in education. Distance learners pay roughly twice what Hawaiians do for tuition. Concordia University Chicago offers an MA in educational technology program designed for aspiring teacher leaders who want to learn how to integrate technology into the classroom. The program is perfect for licensed teachers looking for a career track towards technology specialist, director, or coach. The 30-credit curriculum equips students with the skills needed to improve the effectiveness of instruction in K-12 settings. Coursework covers a variety of topics, including visual literacy, emerging technology trends, and educational technology leadership. A final capstone project illustrates a student's technical mastery and understanding of core program content as applied to an area that aligns with their professional interests. Completion of this master’s in educational technology online qualifies graduates for the Illinois technology specialist endorsement. Faculty make an effort to interact with students on a regular basis, providing assignment and discussion feedback and holding open office hours during the week. Students enroll in one course at a time in a fixed sequence, with each course lasting only eight weeks. By following this fixed course sequence, students can earn their degree in 24 months. The program offers start dates in the fall, spring, and summer semesters. Applicants must have a minimum GPA of 2.85 in undergraduate work or a master’s degree with a minimum GPA of 3.0 to be considered. Applicants who do not meet these requirements may be eligible for probationary admission. Additional admission requirements include a statement outlining professional and educational goals and two letters of recommendation. International students should also submit a resume, declaration of finances, and qualifying English as a second language exam scores. CUC offers a locked-in tuition rate as long as a student stays continuously enrolled in educational technology online master’s program. The program is accredited by the International Society for Technology in Education. Antioch University New England offers its online educational technology degree as a hybrid program. Students take six courses online, three courses as practicums in the field, and two courses on campus in Keene, New Hampshire. The university’s 33-credit EdTech Integrator program consists of 70% pedagogy and 30% tech, and it leads to EdTech Integrator certification in the Granite State. Antioch considers technology an important component to the construction of learning communities. The program caters to working teachers and offers it as part of its "master of education for experienced educators" curriculum. Antioch stresses management and leadership skills in its curricula. The university also emphasizes collaboration, experiential learning, and individualized attention -- hallmarks of the EdTech Integrator program. Most faculty use asynchronous formats for maximum flexibility, allowing teachers to continue working in their classrooms as they earn their degrees. The school schedules the one- and two-week residency requirements during the summer. Participants typically complete the practicums using their own classrooms. Antioch offers several degrees for educators interested in expanding or enhancing their career options, including master’s of education for experienced educators programs in sustainability education, library media, mindfulness in education, and problem-based learning. It also boasts a post-graduate EdTech Integrator certificate option. Applications for Antioch’s educational technology online master’s must include a resume, official transcripts, and two letters of recommendation from academic or professional references. The university does not require the GRE, but it does require an interview. The program has three start dates per year. One of the oldest institutions of higher learning in Texas, TAMUC offers a wealth of web-delivered programming, including online educational technology degrees with focuses in leadership and library science. Both programs give students the option of enrolling in a master of arts or master of science, depending on whether learners want to move into the workplace or continue toward a terminal degree. Both programs also work toward instilling a philosophy that incorporates literacy, research, and best practices in the integration of technology into K-16 classrooms and libraries. TAMUC’s online master's in educational technology tracks differ in their core and credit requirements. The leadership track requires students to earn 30 credits, while library sciences requires an additional six credits. Students access coursework asynchronously, and can complete their studies entirely online. Most students take two classes per one, seven-week term. With two terms in a semester, participants can accrue six credits every semester while only having to take a single course at a time. The university requires that degree candidates complete two-thirds of their credits through TAMUC, allowing only 12 transfer credits. The library science track requires a 160-hour practicum serving in a library under the supervision of a qualified librarian. Graduates earn certification in Texas, but students should check requirements for the state where they plan to work. TAMUC provides online learners with access to tech support, library services, advising, career counseling, and even the campus bookstore. Online students pay more than Texans for tuition. Applicants must submit transcripts and GRE scores. The application committee may request letters of reference and a personal interview of some candidates. A large land grant university in Starkville, Mississippi State hosts a master of science in instructional technology (MSIT) that offers students the choice of three specializations: instructional design, distance education, and multimedia. The university built the 33-credit MSIT program for working people. MSU divides the curriculum almost in half between required courses and classes in the focus area, and students can elect to do a thesis or not. Those who opt out of the thesis must earn six additional credits in electives. Offered through MSU’s Center for Distance Education, the master’s in educational technology online prepares graduates for jobs as curriculum developers, trainers, elearning specialists, web designers, and multimedia experts. Coursework focuses primarily on the tech-related aspects of education. Students produce an electronic portfolio as they move through the five core courses and electives. The minimum requirements of the portfolio include a professional home page, a professional vitae, and a personal reflection. Some MSIT exams may require participants to find a local proctor. The Department of Distance Education offers three start dates per year. Candidates must submit official collegiate transcripts, a letter of purpose, and GRE scores. The university requires applicants to possess a 3.0 cumulative average on their undergraduate record, but it will accept some students on a provisional basis. MSU grants up to six transfer credits from a recognized institution toward the degree. All distance learners pay in-state tuition, and many are eligible for financial aid. The Southern Association of Colleges and Schools Commission on Colleges accredits MSU. Concordia University–Saint Paul was founded in 1893 and enrolls roughly 4,000 students each year. The school offers a master's of arts in educational technology that is designed for experienced teachers who wish to enhance their teaching skills in order to optimize student achievement through technology. Concordia is accredited by the Higher Learning Commission. The 30-credit master’s in educational technology online program follows an accelerated, two-year cohort model that includes fieldwork and a capstone project. Students typically participate in one weekly virtual session alongside asynchronous coursework, completing one three-credit course every seven weeks. While the program doesn't include face-to-face meeting requirements, students are encouraged to meet with their advisors via Skype or other virtual meeting software weekly. All required education technology courses online are completed in a fixed sequence, starting with foundations and trends in education technology and ending with a capstone project. Other fundamental courses include diversity in education and leadership in educational technology. Courses can be complete asynchronously online, allowing students to complete coursework at their own pace. All graduates are awarded a technology certificate upon completing the program. Applicants to this online master’s in educational technology program must be educator practitioners through either work or volunteer experience. Admission requirements include official transcripts with at a minimum GPA of 3.0, a resume, and a personal statement describing career goals. All online students at Concordia University–Saint Paul pay the same tuition rate, regardless of residency. Concordia hosts a corporate partnership program, which offers eligible employees a $2,000 tuition discount for any graduate degree. Current corporate partners include AT&T, United Airlines, the YMCA, and more. Known widely for its School of Education, Iowa State University created its online master’s in instructional technology for classroom teachers and other professionals that want to learn more about how to integrate technology in learning and teaching effectively. The ISU 30-credit program allows educators to continue working while earning their degree. Students enter into a cohort and proceed through the curriculum together, taking one course at a time across three years. The university keeps cohorts small -- 18 pupils, max -- to encourage collaboration among participants and professors. Cohorts begin in the summer. Focus areas include learning, pedagogy, and leadership. The curriculum of Iowa State’s master of education in curriculum and instructional technology focuses on foundations, research, and applications of technology in educational settings. Some of the program’s highlights are: authentic learning experiences, collaborative learning environment, and experience using new and emerging technologies for education such as web 2.0 tools, digital storytelling, and social media, and many mobile apps. Instructors are tenure-track university faculty and the coursework is asynchronous with a minimal synchronous time required for group work and project presentations. Each participant assembles an eportfolio as their culminating experience; the eportfolio consists of a research paper and artifacts from classes collected along the way. In their final semester, learners present their project to a two-faculty committee for review. Admission includes acceptance to the university’s graduate program followed by approval from the School of Education. Applicants must submit a resume, three letters of recommendation, a statement of purpose, and official transcripts from all undergraduate and graduate institutions. All distance learners pay in-state tuition. The University of North Texas is a public university that is located in Denton. The school offers bachelor's, master's, and doctoral programs. UNT's online program offers certificates, as well as a master's degree in learning technologies. Students learn about many educational technologies that will help them create, deliver, and enhance learning experiences. Learners explore subjects such as human learning and cognition, instructional design, education tools and technologies, and the effect of computers on learning. Graduates are prepared for careers in instructional design and technology in academic and business settings. The online learning technologies program is taught in an accelerate format, which allows students to earn their degree in 14 months. The degree includes multiple learning tracks and certificates. Degree tracks include instructional systems, instructional systems technology, and instructional systems design. Certificates require student to earn 12 credits, and UNT offers seven, including technology integration, technology and autism, and web development and management. The instructional systems technology track expands on the instruction systems track. Students focus on systems and technology that are used to deliver learning. Graduates are prepared for positions as directors, managers, or developers of learning systems technology. Students receive access to multiple school laboratories, which will help them throughout their studies. This includes the Center for Knowledge solutions and the Technology and Applied Research in Autism. Students must submit their degree plan before completing the first 12 credits. The program requires learners to earn at least 36 credits. This includes 24 core credits and 12 concentration or elective credits. Learners must also meet the admissions requirements for the graduate school. While specific requirements and coursework will vary between programs and schools, these educational technology online master's programs prepare teachers and K-16 technology facilitators and resource personnel to integrate technology into an educational environment. The program can also be used for implementing technology into training programs in the private sector. The following is a general overview of what you can expect from most online master's in instructional technology programs. The following is a sample curriculum featuring many common courses in educational technology online master's degree programs. Introduction to Instructional Technology: This course presents an overview of the International Society for Technology in Education and the National Educational Technology Standards for Teachers. Students will explore methods of incorporating instructional technology as a teaching and learning tool in school and non-school settings. The course also provides an opportunity for students to get hands-on experience utilizing software and technology as teaching tools. Mobile Technologies in Education: Students explore how mobile technologies, including wearables, tablets, and augmented reality applications, are used to teach in classroom settings and other informal environments. Learners analyze case studies and identify common strategies for integrating mobile technologies and how these are adapted based on economic, educational, and socio-political contexts. Distance Teaching & Learning: The coursework examines theory and practice of various forms of synchronous and asynchronous distance education models. Students interpret and apply theory, research, and standards-based effective practice to distance learning design, development, and evaluation. Topics include applying design and learning standards in a range of development and delivery tools. Instructional Design: This course focuses on applying instructional design principles to the development of instruction. Topics include foundations in learning research, learning situations and instructional models, innovations in software and hardware, and contemporary trends and issues in instructional design. Philosophies of Education: In this course, students examine the educational issues confronting society and philosophical problems. The purpose of this course is to provide a foundation for understanding concerns regarding modern society and education. HOW LONG DOES IT TAKE TO GET AN ONLINE MASTER'S IN EDUCATIONAL TECHNOLOGY? Online educational technology degrees usually require students to earn 30 to 39 credit hours. Most master's degrees can be completed in two years. Some considerations that affect the length of an online master's in instructional technology program include the availability of summer term courses, whether programs require the completion of a thesis in order to graduate, and whether the student is pursuing a dual degree program. Another important factor is whether the program is cohort-based, which requires students to move through courses in a particular sequence with a group of their peers. Cohort-based programs tend to have a more rigid timeframe for completion. Students who prefer to set their own pace should select individually paced programs rather than cohort-based programs. Certified Education Technology Leader: Demonstrates the mastery of knowledge and skills necessary to successfully build and implement modern K-12 learning environments. This certification prepares professionals for careers as chief technology officers, technology directors, chief information officers, and directors of digital learning. Online master's degrees in instructional design and technology can hold specialized accreditation through the Council for the Accreditation of Educator Preparation (CAEP). The goal of the CAEP is to advance the preparation of educators through evidence-based accreditation, assuring quality and continuous improvement to strengthen student learning. Online educational technology degrees can obtain accreditation through national and regional accreditation bodies, which ensures that institutions of higher education meet acceptable levels of quality. There are a total of 19 recognized accrediting bodies in the U.S., which are reviewed for quality by the U.S. Department of Education and/or the Council for Higher Education Accreditation, an association of 3,000 degree-granting institutions. A list of all accredited schools can be obtained through the DOE or CHEA websites. Many careers in education are attainable with a bachelor's degree, but most positions related to classroom teaching, school administration, and curriculum development heavily favor candidates who have earned a master's degree. As a result, unemployment rates are much lower for master's recipients working in education. The table below features data published in 'From Hard Times to Better Times', a 2015 report from the Georgetown University Center on Education and the Workforce (CEW). As the table indicates, unemployment rates are better for education master's degree-holders across the board; please note that the master's degree fields listed below include those with specializations in fields like educational technology. For comparison, the unemployment rate for all occupations in the U.S. currently sits at 4.3%. Salaries in educational technology will depend largely on the employee's experience level, as well as other factors like degree attainment level, certification status, school size, and city/state of employment. The following table features career salary projections for five of the most popular careers linked to educational technology. A master's in educational technology will be suitable for any aspiring teacher, school administrator, or instructional developer with an interest in bringing technology to the classroom. Five popular career paths for online educational technology degree recipients are described below, along with their median salaries and projected job growth over the next seven years. Instructional Coordinators: Instructional coordinators are responsible for developing and implementing curricula and learning standards at elementary, secondary, and postsecondary schools. They must be familiar with various forms of educational technology, and may also have a hand in designing new tools and platforms. They also analyze test scores and evaluate students to ensure their implementations are effective. Kindergarten and Elementary School Teachers: Technology plays an important role in K-3 education as students acquire foundational knowledge and skills in core study areas; most classrooms feature computers equipped with games and programs designed to help students build these areas, and many teachers have introduced tablets into their lesson plans as well. Kindergarten and elementary teachers must also craft lesson plans that incorporate learning technologies, and demonstrate how to use them for their young students. High School Teachers: In recent years, educational technology has become fundamental at the high school level. Students are required to complete assignments and projects using web-based sources, and most schools include tech-based courses as part of the standard curricula. High school teachers are responsible for helping students utilize technology in order to excel in their classes, as well as enabling them to use these tools and platforms as they advance to college or enter the workforce after earning a diploma. Elementary, Middle, and High School Principals: Principals oversee all day-to-day activities at public and private school across the country, including curriculum development and the implementation of educational technology. They also work with other administrators to evaluate overall student performance based on several factors, including access to reliable learning technology. They are also responsible for ensuring that their teachers are integrating technology in an effective, impactful way. Special Education Teachers: Today's educational technology offerings include various programs aimed at students with emotional, behavioral, physical and/or cognitive disabilities. Special education teachers lean on these tools and platforms as part of their daily classroom routine. They may also work with parents or guardians of students to help them integrate these helpful technologies into their home life. Many master's in educational technology online program graduates benefit from obtaining membership with a professional organization grounded in their field. These organizations grant access to academic journals and publications, invite members to attend conferences and networking seminars, offer reduced rates for certifications and professional development courses, share job leads, and provide advocacy on behalf of the entire profession. Three leading organizations in the field of educational technology are outlined below. International Society for Technology in Education: For more than 40 years, ISTE has bridged the gap between educators and computing technology. The society has produced comprehensive learning standards for students, teachers, administrators, coaches, and dedicated computer science teachers. ISTE also holds an annual conference, and offers a wide range of online courses and webinars. State Educational Technology Directors Association: SETDA is a nonprofit organization launched by state education agency leaders in 2001 that has spread to every state and territory in the U.S. The association provides resources focused on five core areas: equity of access, digital content, online assessment, interoperability, and digital learning. SETDA also strives to provide advocacy for various educational technology policies and implements, and also offers professional development opportunities for members. Association for Educational Communications and Technology: Founded in 1923 as the National Education Association's Department of Visual Instruction, AECT today boasts 24 state and six international affiliates. Member benefits include invitations to conferences and professional networking events, access to an extensive selection of online publications, scholarships, internships, and reduced insurance rates. Standard membership is available for $135 per year, while students can join for $75 per year. An online master's degree in educational technology is a significant financial investment, and as a result many students must rely on financial aid to afford the various costs associated with these programs, including tuition and course supplies, housing, meals, and administrative fees. A large number of undergraduates and graduate students receive support through federal student loans, which ― unlike private loans ― carry a fixed interest rate. You can learn more about federal loan opportunities by submitting a Free Application for Federal Student Aid (FAFSA). In addition, a wide range of scholarships, grants, fellowships, and work-study programs are available for students earning a master's degree in educational technology online. For more information about financial aid options, please visit the links below.